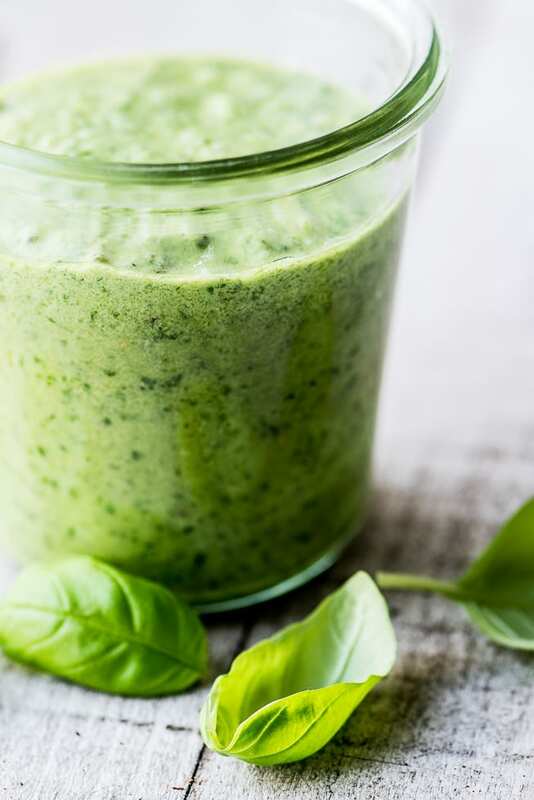 Spicy Basil Pesto ~ Serrano pepper takes the world’s freshest sauce from simple to sassy in one fell swoop ~ stir it into freshly boiled pasta, spread it over grilled fish, spoon it on a baked potato, or soak it up with a torn piece of bread, it makes all other sauces obsolete. 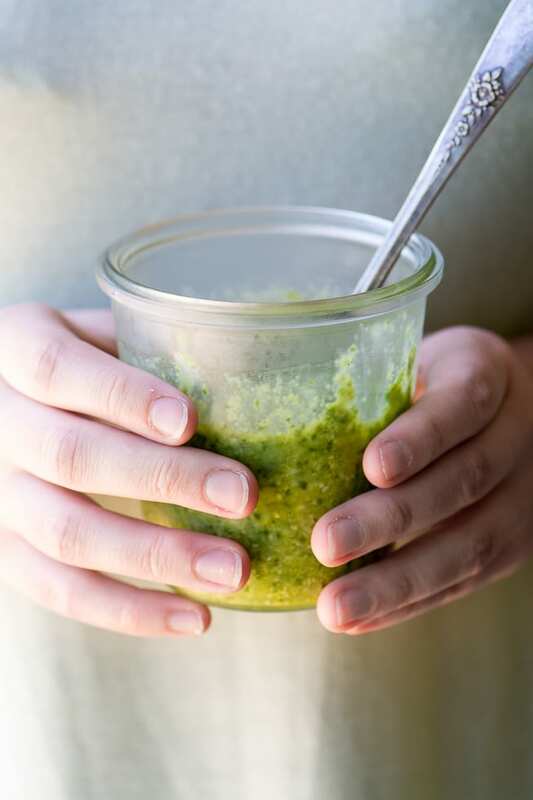 Pesto is the original awesome sauce. 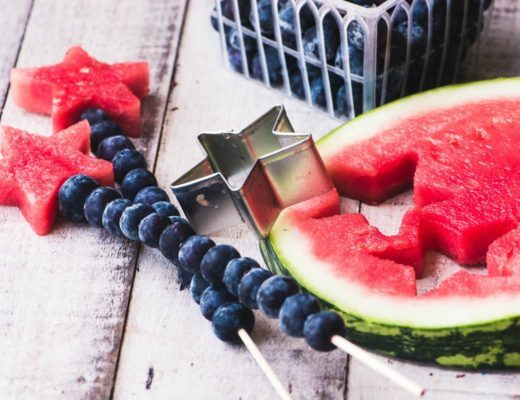 Of course I make it all summer long, but to tell you the truth I enjoy it most during the cooler months — it’s a real palate refresher after a heavy diet of chilis and casseroles. And the great thing is you can get all the ingredients year ’round, so you never have to be without a freshly made jar of this stuff. Next to tomato, it’s got to be the most versatile sauce out there. TIP: Do you want to know a secret? 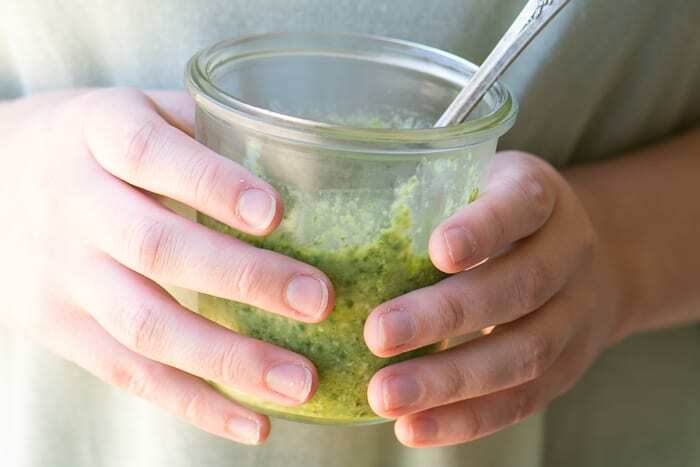 The way to get the BEST pesto is to use LIVING basil, that is, just picked from your yard, or from a potted plant that you can buy at most grocery stores these days. The color and flavor is superior. 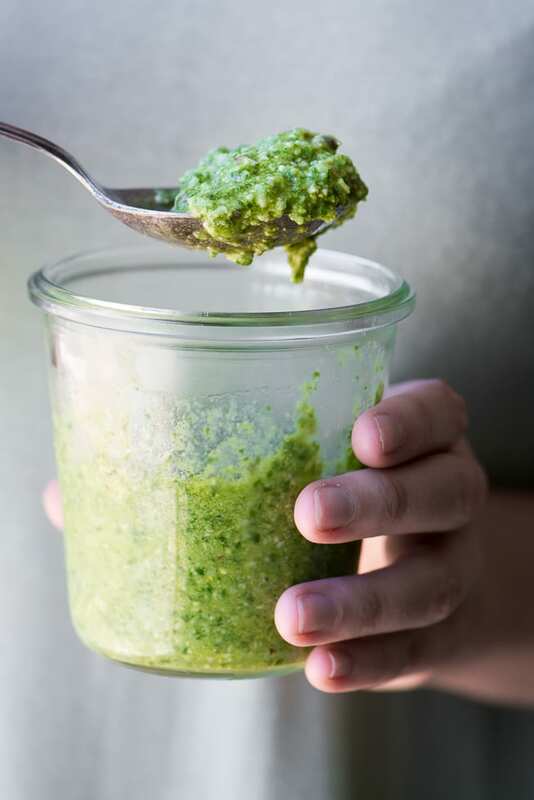 Once you’ve made pesto once or twice you’ll realize you don’t need a recipe, you can use your instincts and add the ingredients by eye, you simply can’t go wrong. No two pesto recipes will be the same, and that’s a great thing. By adding a little of this, or a little of that, you can customize it endlessly. Your pesto can be thick or thin, cheesy or vegan, nutty or not. Today I dropped a Serrano chili into my processor and created something really special. This got raves all around, it’s spicy but not too much. TIP: Going without a recipe is scary for some, it feels like jumping out of a plane without a parachute, but it’s so worth it to develop a few dishes that you can whip up without being tied to a phone, computer, or book. Pesto is the ideal place to start, you can’t screw it up! Dress hot or cold pasta. Spread it on roasted chicken, salmon, steak, or pork. Use it as a mayonnaise replacement in chicken or shrimp salad. 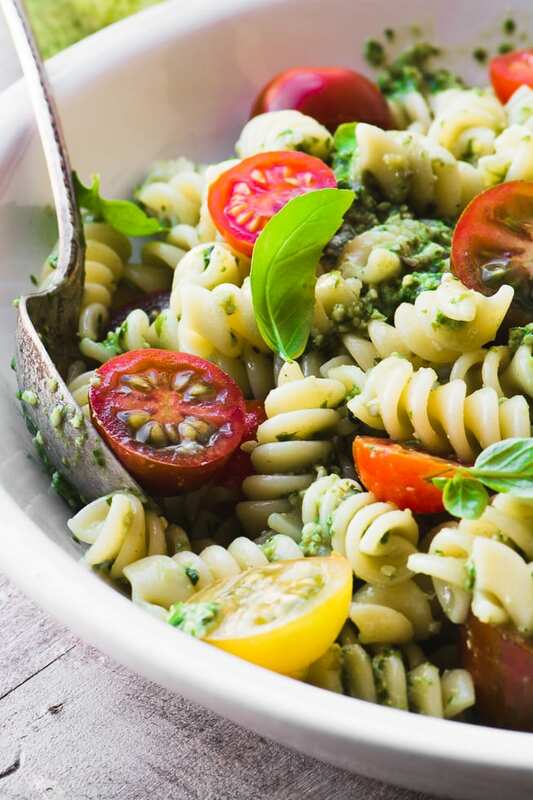 TIP: Shape matters, so choose a pasta that will embrace your sauce, I prefer rotini because it grabs and holds more of this zesty Spicy Basil Pesto than any other. Drop the garlic clove into a food processor while it is running, and run the machine until the garlic is finely minced. Trim the stem off the hot pepper and slice it in chunks. Add it to the machine, seeds and all, while it is running, and wait until it is finely minced. Next add the pine nuts and Parmesan cheese and process until everything is smooth. Add the basil and lemon juice and pulse, scraping down the sides of the machine a few times, until the basil has broken down. Drizzle in the olive oil while processing. Process until the pesto is as smooth as you like. It can be chunky or smooth, it's your choice. Season to taste with salt and pepper, and add more olive oil if you want a looser pesto. 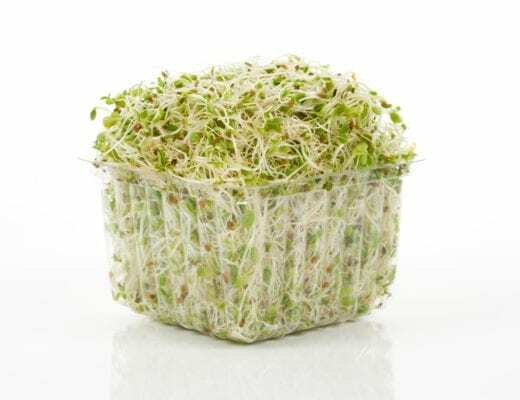 Store in the refrigerator in an airtight container, and use within 10 days. This is a small batch recipe, double or triple the ingredients for more. For a small batch I use my mini food processor, but move up to your full size machine for larger amounts. Hi there…. just love your recipes. Save and use often. 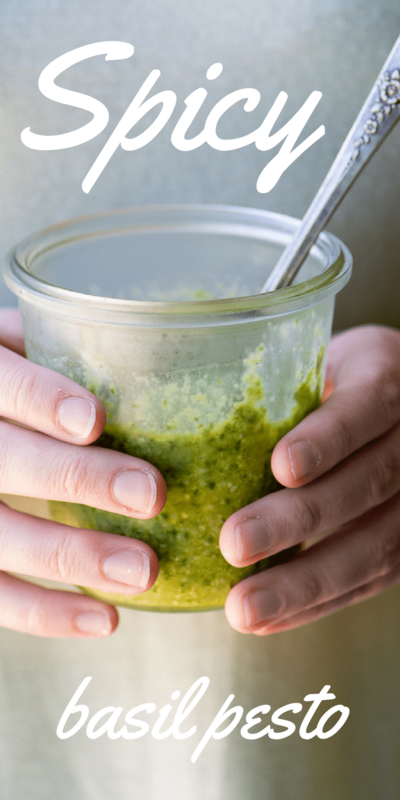 Does your pesto recipe freeze well? This looks delicious! I don’t have a food processor–do you think I could make this in a blender? Yes absolutely, you might just have to scrape down the sides often, depending on your blender. Enjoy! I love pesto. I’ve never thought to make a spicy version. Thanks for the recipe! Hope you give this one a go, Jeff! I am loving this ‘sassy’ version of pesto, Sue! I’d love this over some fresh tomatoes and drizzled with balsamic too! What a beautiful color. my favourite basil for pesto is Genovese , it has so much flavour. Yes I freeze lots to use all winter. I love your new twist on pesto. I can always count on you for a new creative recipe idea! I love the idea of taking classic pesto and making it spicy, my basil plants are still producing so I’m definitely trying this ASAP! 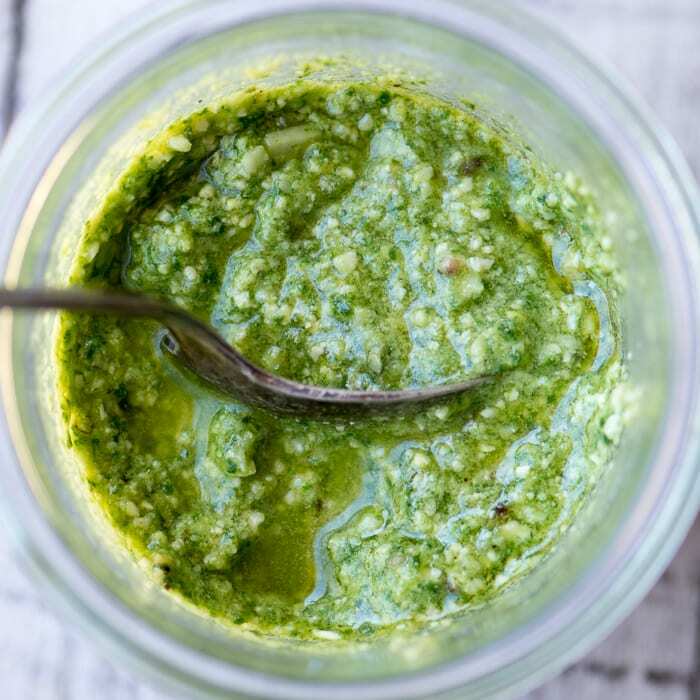 I’m loving the spice you added to your pesto – such a great way to take dinner up a notch! I do love pesto too and more in the fall and winter months. Maybe it’s a taste of summer with snow on the ground. So I make LOTS of it in summer when my basil plants are waist high. I freeze it in ice cube trays to add a cube to pasta, a panini, soup….anywhere…..And everywhere. Wonderful idea, I didn’t think pesto could get any better but this new twist sounds amazing! I love that you are forever coming up with something out of the ordinary! I love pesto! I’ll have to try making it with the serrano pepper. The kick must be great! I’ve made pesto before but I I’ve never thought about making that a little spicy. Already love it! Just that little tweak makes a big difference! I adore that bright green color. I bet it smells and it tastes amazing. I can’t imagine how delicious it is in a pasta salad, YUM!! This looks oh so good. I love a good sauce that you can use in so many different ways. Loving this pesto with a bite! :) Pesto is such a great thing to have on hand and I agree that fresh (living) basil makes the absolutely best pesto! Thanks Jennifer…I’ve always been baffled why sometimes my pesto turned an immediate olive green, and didn’t retain that gorgeous color — I used to use whatever basil I could find…usually in those plastic cartons. Since I discovered the benefits of using the live basil, I’ll never go back! Pesto sauce is so good for so many things…I love it esp. with roasted veggies. I do too, we drizzle it on roasted potatoes and it’s fantastic.